JAKARTA, Mar 31 2017 (IPS) - Fifty-two-year-old farmer Theresia Loda was effusive when asked how conservation agriculture has changed her economic situation. “My corn harvest has increased fourfold per season since I started practicing conservation agriculture,” Loda told IPS by phone from Kalimbu Ndara Mane Village, Wejewa sub-district in Southwest Sumba District, East Nusa Tenggara (NTT) province, around a two-hour flight east of the capital Jakarta. Conservation agriculture encourages farmers to keep soil disturbance at a minimum. Instead of ploughing the field, farmers dig permanent planting holes and use compost instead of chemical fertilizer. They are also urged to grow cover crops such as legumes, and to rotate crops. Loda started practicing conservation agriculture on a 2,800 square meter plot in early 2015. In the first season, she harvested around 500 kilograms of maize, compared to between 100 and 150 kilograms using traditional techniques. Her harvest soared up to 800 kilograms in the second season, before it went down to 600 kilograms in the October 2016-February 2017 season. The widow and mother of 10 said she sold the maize to local people and used the money to send her children to school. In 2016, she sent her fifth child to study in a nursing academy in Malang, East Java province, one year after he graduated from senior high school. Loda’s first and third children dropped out of school in grade five, while the second and fourth finished senior high school but were not able to go to academy or university due to financial constraints. Her sixth to ten children are still in senior high, junior high, and elementary schools. In 2016, Loda, who separated from her second husband in 2010, used part of her maize income to buy piglets and rent a paddy field in order to augment her income. Her first husband passed away in 1994. “I just sold two pigs to pay my fifth child’s tuition in Malang. Next week, we will harvest rice from our farm for the first time,” said Loda. Mikhaela Imakulata, a 45-year-old farmer in Sikka District, shared Loda’s sentiment. “We harvested around 2.6 tons in the first season, compared to 2.1 tons when using the traditional method,” the mother of two told IPS from Maumere, the capital of Sikka District, on Mar. 24. Imakulata said she and her husband cultivated an area of over 1,100 square meters. Aside from corn, they also planted a wide range of bean varieties as cover crops. “We just planted maize again immediately after we harvested the first planting. We want to find out how the weather will affect the crop,” she said. Loda and Imakulata are two of almost 13,000 smallholder farmers in NTT and West Nusa Tenggara (NTB) who practice and benefit from conservation agriculture the Food and Agriculture Organization (FAO) introduced there in 2013 as part of its priority program of reducing disaster risks caused by changing climate in the country. According to Ujang Suparman, FAO national project manager for NTT and NTB, conservation agriculture projects were also implemented in West Sumba, Central Sumba, East Suma, Sabu, Malaka, Timor Tengah Utara, Timor Tengah Selatan, Alor, Lembata, Nagekeo, and Ende, West Lombok, Central Lombok, East Lombok, North Lombok, and West Sumbaw. “Smallholder famers in NTT and NTB are among the poorest in Indonesia. 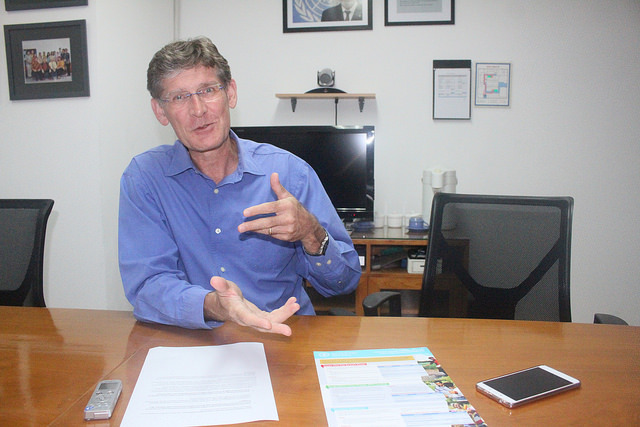 They are prone to the impacts of climate change, especially long dry spells and irregular rainfall,” Mark Smulders, FAO representative for Indonesia and Timor Leste, told IPS in an interview in Jakarta. According to Smulders, conservation agriculture is a win-win situation. “On one hand, we conserve the soil, which means we protect the soil from the sun, preserve the moisture, bring in organic materials, and on the other hand, farmers boost production and at the same time are better protected against climate change,” he said. Data provided by FAO Indonesia and Timor Leste show conservation agriculture has proven to increase maize yield from an average of 2.1 metric tons to 4.3 metric tons per hectare. “For us, the most important aspect is the increase in productivity, profitability, and resilience to climate change,” said Smulders. Aside from conservation agriculture, FAO Indonesia and Timor Leste also encouraged farmers here to try integrated rice-fish farming, locally known as mina padi, where part of the irrigated rice field is turned into fish ponds. According to Smulders, while mina padi is quite different from conservation agriculture, both are trying to intensify production using an ecosystem approach with far less use of chemical fertilizers and pesticides. “What we do in mina padi is we take part of the rice field and make it into fish ponds. But fish also swim in between the rice and eat all the pests, fertilize the rice with their feces, and in the end we get better yields, better income, and better nutrition because farmers do not only eat rice they harvest but also the fish,” said Smulders. Around 37 percent of children under five in Indonesia are stunted as a result of chronic malnutrition in the first five years of their life. On top of that, some 20 million people, or almost eight percent of the country’s population of 260 million, simply do not have access to the basic dietary energy that they need. “We would like to put emphasis on a healthy diet from the farm to the table. We would like to see farmers produce a healthy diet, not just rice but other products as well,” Smulders said. 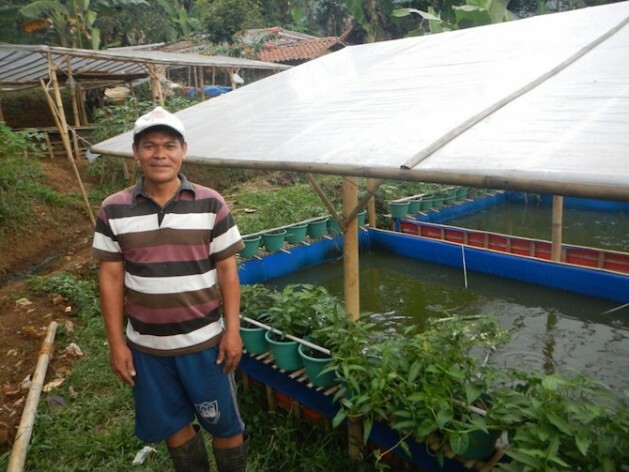 Sigit Paryono, a 46-year-old farmer in Sleman District, Yogyakarta, said his net income has risen significantly since joining FAO’s mina padi program in 2015. “I used to earn between 38 dollars and 76 dollars per 1,000 square meters, now around 226 dollars,” said Sigit, who claimed to have a half-hectare of rice field. Sigit said since joining FAO’s program in 2015, he has earned enough money to buy another 5,000 square meters of rice field. “I also sent my two children to universities,” he said. “I hope FAO would help farmers in post-harvest processing. We want to sell mina padi rice and fish ourselves but we cannot do it without any help from others,” Sigit said. Pramono, head of the Food Security Division, Sleman Agriculture and Fishery Agency, said mina padi works for both commodities. Rice benefits from food leftovers and fish feces as fertilizers, while fish benefit from pests that serve as their food. “With pests eaten by fish and their feces serving as fertilizer, farmers need no pesticides or chemical fertilizers,” said Pramono. He said his office introduced the embryo of mina padi to local farmers in 2011. “In 2015, with financial assistance from FAO, they were able to form a cluster of 25 hectares of rice field. At least 20 percent of the rice field is allocated for fish ponds,” said Pramono. “While planted rice fields decrease by 20 percent, yields increase by 30 percent on average. On top of that, farmers still harvest between two to five tons of fish per hectare,” Promono told IPS. Rice-fish farming was also experimented with in West Sumatra province. Smulders said both conservation agriculture and mina padi were in line with the Indonesian government’s plan to create over 1,000 organic villages. “All three techniques, including integrated pest management, could be useful technics to promote organic farming,” he said. He also said that his office is having discussions with the central government on how to scale up conservation agriculture and rice-fish farming areas. “We feel we don’t have the capacity. We have demonstrated the good practice. Now, we want the government to invest. It’s a good thing to promote the two,” Smulders said. FAO, according to Smulders, would focus on how to minimize post-harvest losses through improved storage. Too often, he said, farmers sell corn and rice at harvest time so prices are low. “We are planning to work on a storage facility” so farmers can keep their commodities and sell them at higher prices several months later, Smulders said. Indonesia’s precipitation has shown less tendency towards drought. Globally, overall occurrence of drought has been decreasing. Setiawan, A. M., et al. 2017 “Observed and blended gauge-satellite precipitation estimates perspective on meteorological drought intensity over South Sulawesi, Indonesia.” IOP Conference Series: Earth and Environmental Science.